Eat more carbs. Supply the body with efficient energy fuel found in grains, starchy vegetables, fruits, low-fat dairy products, and carbohydrate-replacement drinks. Obey your thirst. Drink fluids before, during, and after exercise to prevent dehydration, but avoid over drinking. Take a multivitamin. When your diet isn’t enough, extra vitamins and minerals will help your body get the nutrition it needs for exercise. 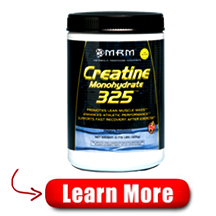 Check out creatine monohydrate. Take 15 to 20 grams a day of this supplement for five or six days to improve performance of high-intensity, short-duration exercise (like sprinting) or sports with alternating low- and high-intensity efforts. Try vitamin C. Take at least 400 mg a day for several days before and after intense exercise to reduce pain and speed muscle strength recovery. Creatine Monohydrate can positively affect muscle size and cell volume and studies show its ability to decrease muscle fatigue during performance and muscle soreness the following day. 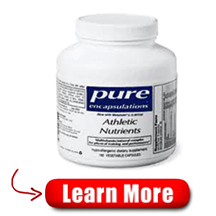 Athletic Nutrients is designed to support physical training and performance. It is a complete hypo-allergenic, nutrient rich, highly bioavailable multi-vitamin, multi-mineral and trace element supplement. The formula combines superior mineral cofactors, activated vitamins, antioxidants and pH balanced creatine to target endurance, energy and lesson muscle fatigue. 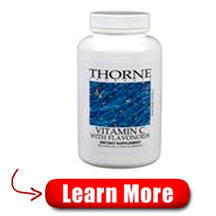 Vitamin C with Flavonoids is a popular combination of pure ascorbic acid and citrus bioflavonoids. Vitamin C (ascorbic acid) is one of the most well known nutrients worldwide.